113. THE CHALLENGER VOYAGE. Issued by Brooke Bond Foods Limited. (1971). Card number 3 from a set of 48 entitled "Exploring the Ocean—Explorons L'Océan" Size: Ca. 2.7" x 1.45". 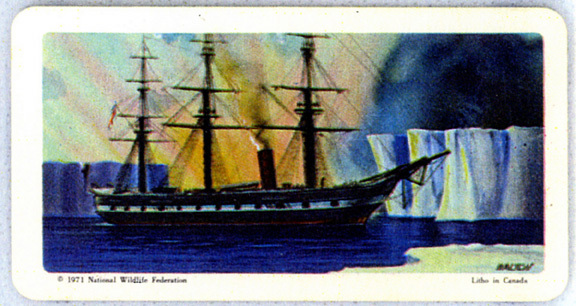 Recto: View of the Challenger with icebergs at rear. Artist's name (unreadable) in lower right corner of image. At lower left: ©1971 National Wildlife Federation. Lower right : Litho in Canada.